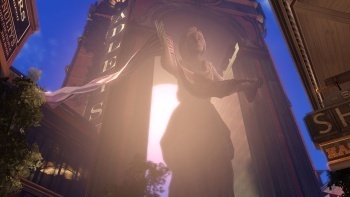 Ken Levine says the BioShock Infinite team won't develop a multiplayer component for the game unless it is "absolutely convinced" that it will live up to the single-player experience. For all that it brought to the table when it was released in 2007, BioShock was also notable for something it left behind: multiplayer. Online action is a standard feature in just about every FPS to hit the market but BioShock was a purely single-player experience. BioShock 2 managed to shoehorn in some undersea multiplayer shoot-em-up, but Levine, the man behind the original game, says that's no guarantee we'll see it in BioShock Infinite. "We got a lot of questions with the original BioShock saying, 'You're not having multiplayer? It's a first-person shooter - are you out of your mind?'" he said in an interview on the Big O and Dukes Show. "We stuck very firmly to our guns on that, that unless we had something - a multiplayer component that was as compelling as everything else we were doing in the game - we were not going to put the investment into it, because that wouldn't be a service to the product, it wouldn't be a service to the fans and it wouldn't be a service to us - it wouldn't be any good to anybody. "It's not like people won't buy the game if it doesn't have a world-changing multiplayer element. Unless you're Call of Duty, unless you're Halo, unless you've got something new to say like Left 4 Dead, people are not going to care, so why do it?" he asked. The BioShock Infinite team is experimenting with "lots of things" on both the single-player and multiplayer fronts, but still isn't convinced that a multiplayer component is worth investing in. "We're incredibly confident now that we've got a single-player experience that is absolutely going to be incredibly impactful on people," he said. "We're not convinced of that on a multiplayer side at this point." "We're still thinking about it, but unless we're absolutely convinced, it's not something we would do, because I don't see who it serves," he added. The first BioShock notwithstanding, it would be most unusual to put out a major, mainstream FPS without a multiplayer component, but given how generic it looked in BioShock 2 I'd have to agree there's not much point in sinking the effort into it unless the quality of the experience can be significantly raised. Fortunately, there's still lots of time to make that happen: BioShock Infinite isn't expected to come out until sometime in 2012.